Each year American City & County honors new impactful and innovative public projects that communities across the nation completed with the Crown Community awards. Since 1909, American City & County has recognized local governments for extraordinary work in their communities. This month, we present our annual Crown Communities Awards to six innovative and impactful local government projects executed over the past 18 months. American City & County received over 75 applications from cities and counties across the U.S. for this year’s awards, nearly twice as many as we received the previous year. The applicants ranged in size from a few thousand residents to several million inhabitants. These applications represented many different categories such as new structures, innovative financing methods, educational campaigns, sustainability initiatives and more. The selection process proved a tough one. Ultimately, American City & County staff chose projects with meaningful issues, clever solutions, innovative implementation, measurable results and ultimately replicable ideas. 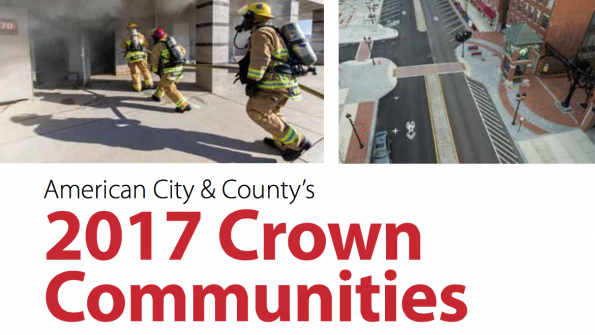 With a network of highway cameras that help solve crimes, a municipal building that gives firefighters live fire training, a main street revitalization that attracted new businesses before completion and a region’s first public orchard, 2017 proved to be an exemplary year for Crown Communities.